Being a Creative Director in the advertising industry for going on two decades I was apprehensive about Material Design. At a glance, it seemed so cookie-cutter and the ultimate brand de-evolution tool to ever happen to the creative industry. So, research began. Most Material designers were using it for mobile apps. Not too much surfacing about custom browser implementations of the Material Design structure. 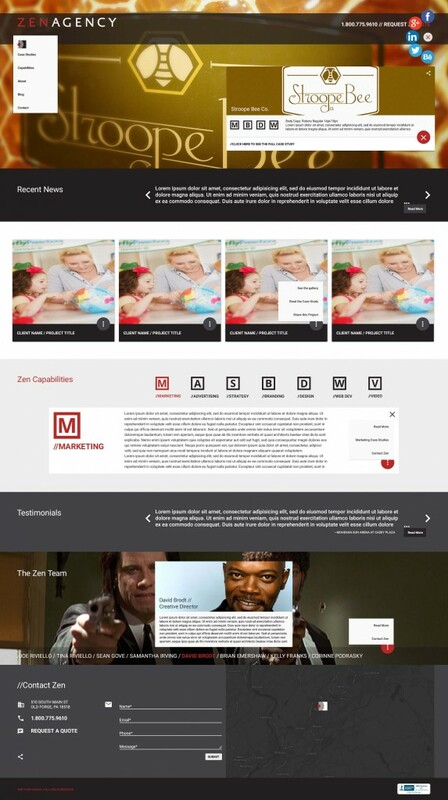 Task: Rebrand Zen Design Firm as Zen Agency. Logo, identity, branding, messaging, blah, blah, blah…all done. Now, design a new website. Be at the forefront of new standards. User-friendly interface, etc. Material Design seemed like the way to go…but it was so damn limiting (as Google set forth in their Standards documentation.) Thanks to Material Design Lite, CodePen, and a bit of retraining my brain to be a coder again, I was able to design an entire asset library of standard elements that were completely to spec. Now the fun part was deviating, yet complying with Google Material Design Standards (meh, somewhat.) The outcome is a compliant backbone, modified skeleton, and some other body reference that coders like. Anyways, I created a small custom sprite, modified color palette, customized CSS placements, all Roboto typeface, and used the most elementary of Material Design features, but made them look better. 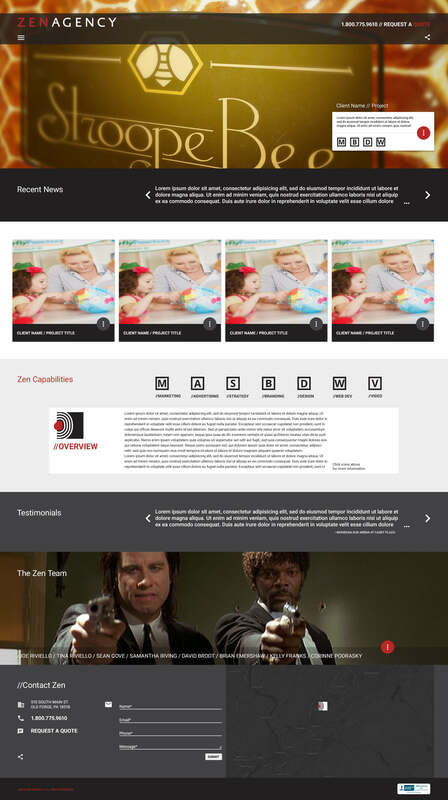 So was born, Zen Agency [draft 007]. Designed with the brand standards that were set long before Material Design. A unique take on Material Design and how it can be used, modified, molded, and rebuilt with a bit of creativity to adapt to a brand successfully. The site is going to dev in the next couple days and I will keep you all in the loop. I am warming up to the challenges of Material Design and would welcome any client at this point to bring a problem that needs a creative solution. Default and Expanded Functionality views.